WASHINGTON (CNN) -- If there was any question about whether President Obama would do anything to bring the Olympics to Chicago in 2016, he's put those doubts to rest. 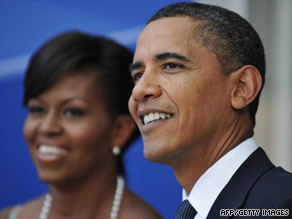 The Obamas hope an appearance in Copenhagen will boost their chances of bringing the Olympics to Chicago. He and first lady Michelle Obama have embarked on an unprecedented joint diplomatic mission to beat out Madrid, Spain; Tokyo, Japan; and Rio de Janeiro, Brazil, for the Summer Games. "What a dynamic duo they will be. I think it will be high impact, I think their presentation will be very personal, given that they know and love Chicago so well," senior adviser Valerie Jarrett said. The Obamas' overseas trip to Copenhagen, Denmark, is just the latest move in their campaign to turn their hometown of Chicago, Illinois, into the host of the Olympics. Last month, they held an event on the White House lawn to help rally support for the Olympic bid. "Now, I may live in Washington these days. I love Washington, D.C. And our house here is a little bigger than the one we got in Chicago," the president said at the September 16 event. "But I've called Chicago home for nearly 25 years." The Obamas are also relying on some help from Chicago resident Oprah Winfrey, who has joined them in Denmark to lobby the International Olympic Committee. IOC members will cast their votes for the winning city on Friday. But what if they fly all the way to Denmark and still fail to collect the gold medal? "If he goes and does not bring home the Olympics, it's going to be kind of a blow for him on the international stage where he is immensely popular, which is really the reason why they think it will help the bid for him to go," said Kenneth Vogel, a senior reporter for Politico. Michelle Obama said she's not worrying about the outcome. For now, she said, she's just giving it her all and letting the chips fall where they may. Republican National Committee chair Michael Steele and other critics have questioned whether the president should take on yet another challenge amid debates over health care and the strategy for Afghanistan. But the administration had little choice but to raise the stakes, White House officials said, given that competitors Brazil, Japan and Spain are all sending their heads of state to Copenhagen. Obama is now the first U.S. president to make such a direct pitch for an American city. The United States has hosted four Summer Olympic Games. The games were held in St. Louis, Missouri, in 1904; in Los Angeles, California, in 1932 and 1984; and in Atlanta, Georgia, in 1996. The last U.S. city to host the Olympics was Salt Lake City, Utah, which was the venue for the 2002 Winter Games. In April, the U.S. Olympic Committee chose Chicago over Los Angeles as the U.S. bid city. Earlier, three other U.S. cities were in the running: Houston, Texas; Philadelphia, Pennsylvania; and San Francisco, California.